Noah (2014) Directed by: Darren Aronofsky Writer: Darren Aronofsky, Ari Handel(screenplay) Stars: Russell Crowe, Jennifer Connelly, Anthony Hopkins, Emma Watson, Ray Winstone Run Time: 138 Min Rated PG (Canada) Rated PG-13 (MPAA)for violence, disturbing images and brief suggestive content. Darren Aronofsky has opinions about the Noah story and he's not afraid to let the world know what they are. They inhabit Noah in such a way that almost everyone who sees this film will walk away either scratching their heads or piping mad. Aronofsky is an equal-opportunity offender: Christians from every stripe will find something they don't like; scientists whether Christian, theist or atheist will find things they don't like; its pro-life plot points will offend the pro-choice crowed as will its environmentalist plot points offend the drill-baby-drillers. It will offend feminists because it's patriarchal and pacifists because it's violent. The only people guaranteed to come out of the film happy will be Aronofsky and his co-writer Ari Handel. How well it continues to fare in the theatres remains to be seen, but at least with a number-one opening weekend and $44 million under its belt domestically, the executives at Paramount Pictures can heave a brief sigh of relief knowing they might break even on their investment. Any film adaptation of the Bible’s Noah story is risky because it must be a theological movie. It has to deal with God because the Scriptural text includes God. If the script cuts out God, the audience knows; if He’s there but silent, anyone who has recently cracked open the binding of a Bible and looked at the Scriptural account will know God is rather talkative. There simply is no way to make a movie about Noah without also making a movie about God. Viewers will quickly realize it requires more than a lot of water, a boat and some computer generated animals to tell Noah's story because Noah's story is bigger than Noah. At its heart Aronofsky's Noah is a theological movie in which he spends a lot of time grappling with the scriptural text, but he doesn't stop there. He also adds extra-biblical texts and ideas. These inclusions are the spots where Aronofsky's opinions become more obvious. It may be worthwhile to ask the question: Why is Noah a challenging story to put to film? As already mentioned, the Biblical account has a rather talkative central character who is not Noah. In the biblical account found in Genesis, God is the only one with dialogue before the flood. Noah has no dialogue until after the flood, his wife has no dialogue at all, neither do sons Shem, Ham, and Japheth nor their wives. Apart from Noah, his father Lamech and his grandfather Methuselah, the Bible gives no ages for any other people in Noah's household. Interestingly, the text of the Bible is careful to give the ages of the male descendants of Adam through Adam and Eve's third son Seth, but the Bible gives no ages to the descendants of their murderous son Cain. When carefully looking at the text it becomes apparent there's not a lot to go on if a vocal and talkative God is taken out of the equation.What’s left is a naked skeleton and when a writer/director needs to fill 138 min of film with Russell Crowe playing Noah, then he’s going to have to give Crowe some dialogue and figure out how to put flesh on the skeleton of the story they've stripped bare of God. That isn't to say God isn't in Noah, it just means God is a great deal more remote in this film than He is in the text of Scripture. Aronofsky is a smart director and he's had a long fascination with the Noah story. According to Variety, while growing up in Brooklyn New Yorkin (1982) a 13-year-old Aronofsky wrote an award-winning poem called "The Dove" about Noah and the Flood. To help put his interest with Noah into perspective it may be helpful to note that Aronofsky is a cultural Jew and therefore Noah is known to him as an Old Testament individual. As an adult, Aronofsky's approach to tackling this story is rooted in a style of Biblical commentary with which most Christian traditions are not familiar. It's a traditional Jewish literary style called a Midrash. A Midrash works to provide commentary on things only hinted at in Scripture with the hope of shedding light on difficult or unclear passages. Aronofsky and his co-writer Handel employed this approach to Jewish religious writing because it's a traditional way of dealing gaps in the original text. For this reason it's important to consider that Aronofsky is abundantly aware that the Biblical text lacks some of the details found in other Biblical accounts; the story of Noah is not as detailed as the accounts of Moses, David or Jesus. When watching the film, knowing the writers were taking advantage of the Bible’s lack of detail helps explain why it is the way it is. It appears Aronofsky and Handel were less interested in what the text says and more interested in what it doesn't say. Which isn't to say what they are doing isn't interesting; it is. But from a Christian’s perspective, without a great deal of explanation the film isn't useful for teaching or devotional purposes. For this reason many will simply steer clear of it altogether. So how does Midrash as a Jewish literary style play out in Noah? An example is the character Tubal-cain (Ray Winstone). He is one of the last people mentioned in Cain's bloodline and the biblical text doesn't indicate when he died or at what agehe died. In addition, the Bible introduces Tubal-cain by saying he "was the forger of all instruments of bronze and iron,"and, because the Bible teaches that he's a descendant of the murderous Cain, Aronofsky and Handel believe it's a legitimate narrative move to show Tubal-cain as a violent man who forges weapons. They also do this, in part, because Scripture describes the men of the world in Noah's day as being greatly wicked with hearts that were continually evil right down to their every thought and intention. Knowing that Scripture teaches that only eight people survived the flood and came off of the ark, Aronofsky and Handel take advantage of the lack of details concerning Tubal-cain's death and age by making him a contemporary with Noah which gives the film's Noah a flesh and blood enemy with whom to contended. They likely feel they can do this providing Tubal-cain dies at some point in the film before Noah and his family set foot on dry land. What Aronofsky is doing is developing drama in the space between what the text says and what the text doesn't say. There is an inevitability to this approach since, as was mentioned before, the vast majority of people mentioned in this part of Scripture—who become the central characters in the film—have no dialogue. As a result Aronofsky and Handel put words in the mouths of their actors because they need dialogue to push the story along and create conflict to advance the plot and provide drama. Using the general methodology of the Midrash they approach this challenge three ways: with speculation; by referencing extra-biblical writings; and by drawing-in things from other areas of canonical Scripture. When they do the first two the film is far less successful and hits the rocks, but when they draw from other areas of Scripture to bolster the story, the film becomes very interesting. Most of the Scriptural themes and events transposed on Noah's narrative are taken from elsewhere in the book of Genesis. For example, later in Genesis readers are introduced to Sarah, Rachel, and Rebekah. All of these are infertile women who are given children because of God’s grace and His promise to Eve immediately after the fall into sin. The reversal of their ability to have children is important to the overall narrative of Scripture because through the children they bear the Messiah eventually comes. They represent bottlenecks in the overall story of Scripture. The account of Noah is likewise one of those bottlenecks where it was imperative for God to act. Aronofsky takes advantage of this overarching Scriptural narrative and transposes Sarah, Rachel, and Rebekah onto Shem's wife, who Aronofsky names Ila (Ema Watson). Within the general plot of Aronofsky's film a lot hangs on Watson's character. One of the biggest places where Noah will fall apart for most Christians is its interpretation of Genesis 6:4 "The Nephilim were on the earth in those days, and also afterward, when the sons of God came in to the daughters of man and they bore children to them. These were the mighty men who were of old, the men of renown." Again, taking advantage of the lack of detail in this verse Aronofsky decides to provide detail by including a combination of personal speculation and details borrowed in part from the extra-biblical book of 1 Enoch. This ancient Jewish text speculates that angels, called “watchers,” interceded in the affairs of men in the days between the Fall and the Flood. Scripture refers to some angels as “watchers” but they are never described as giant rock-creatures building the ark with Noah and his family. In part the reference to “watchers” in the book of Daniel is the jumping off point for the writer of 1 Enoch and Aronofsky injects it all back into the Noah story. What viewers are left with is something that looks more at home in The Hobbit. Aronofsky's film has a supernatural worldview rather than a naturalist materialist worldview. Angels, for example, are massive, intended to be frightening, vocationally service-oriented and dangerous—and that's interesting. Related to this, it’s also interesting that Aronofsky doesn't often contradict the text of scripture outright, but liberally adds to it and subtracts from it to serve his own narrative. Most Christians will find this approach unnerving and will rightly be suspicious of it. While adding to the text of Scripture is not outside the tradition of Midrash as a style of commentary, Aronofsky arrives at a different end than traditional Midrash. The rabbis employed Midrash to support their faith and piety, Aronofsky appears to employ this style to make what he hopes will be a captivating story. The most obvious additions are derived from Gnostic and Kabbalistic sources. Noahis essentially a $125-million creative writing project. It's not possible to point at it and say that it's Jewish, or Eastern Orthodox, or Roman Catholic, or Lutheran, or Calvinist, or Baptist, or Muslim. It's not possible to say it's entirely a left-wing intellectual film or a purely secular film. After watching it it's hard to buy the idea that Aronofsky is Atheist, he clearly has his opinions. The best way to think of it is in the context of confirmation students—young people learning about Scripture in earnest for the first time and brimming with questions. They pepper their teacher with questions like "What day were the angels made?" and "When did Satan go bad?" and "What was Noah's wife's name?" and "Were there dinosaurs on the ark?" and "What kind of wood is gopher wood?" and "If Methuselah died the year of the flood, did he die in the flood or of old age just before the flood?" These are all good questions but have no solid answers. Aronofsky provides his own answers. He made the movie he wanted to make, not the movie people were expecting to see. This is a giant gamble. In NoahAronofsky has provided his opinions. The book of Proverbs says, "A fool takes no pleasure in understanding, but only in expressing his opinion." Was Aronofsky a fool to make this film? As with the recent Son of God film, Noah is what it is; it’s out there in the world for all to see.No one is obliged to see it if they don't want to. 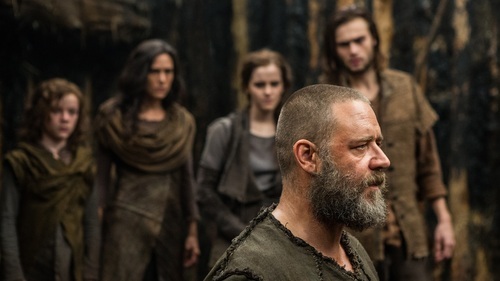 If people do continue to see Noah they will be best served to check all their expectations at the door save one: Expect to see the story Darren Aronofsky wants to tell and not necessarily the one people expect to see especially if you are looking for something faithful to Scripture. Aronofsky's seventh grade poem is now a major motion picture and,for what it's worth, his grade seven teacher must be very proud of him, even if the rest of the world is left more than a little confused. The curious thing about Aronofsky having such a strong opinion is that, regardless of a viewer’s spiritual, religious, political, social, or scientific leanings, it invites the person watching to have similarly strong opinions. Sometimes it's even worse when directors work to personify their ideas about God. Two examples on opposite ends of the spectrum come to mind 1) God as the wise cracking Morgan Freeman in Evan Almighty 2) God as depicted by Alanis Morissette in Kevin Smith's 1999 movie Dogma. Link to article in Variety. Shem's wife name is not recorded in the Bible. The Other Bible: Ancient Alternative Scriptures, Editied by Willis Barnstone, Harper Collins, 2005, pg 487.